March 2009 - Repositories are changing. One of the main drivers for this is the emergence of network-based, or 'cloud', computing and storage. This may sound technical, but it is really an emerging utility and adoption will be motivated more by economics and flexibility than innovation. It will affect computing applications and services that manage digital data, and focus critical review on the role of these applications and services, their value and competitiveness. While this is not only aimed at repositories, repositories are such an application and will be affected. We don't know yet what the outcomes will be, but in this section we bring together strands in the Preserv project that can offer some clues and indicate how institutional repositories might change and adapt. It covers repository architecture, repository management including OAI-ORE, metadata and, since it will guide decisions, repository policy, with some tutorial material as well. The remaining parts of this section provide a critical overview of digital repositories, reinterpreting what they are, what they do, how they relate to digital and physical libraries, how they can be modelled on curation and lifecycle models, and an analysis of the role of repository software. A short glossary of repository terms is provided. What is a repository? What services and processes are repositories based on? 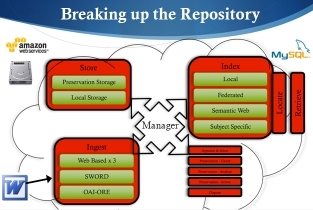 This presentation reappraises repository services and processes, and illustrates how and where services such as preservation can act in emerging repository architectures. Approaches for managing repository storage and file format risk analysis within this framework are presented. "the adoption of a large-scale object store can help turn the repository into a kind of 'thin client', relieving it of the responsibility of simulating a persistent object store." Since copy and collection are an intrinsic part of repository data management and preservation practice, it is obvious that OAI-ORE, which has these motivations at its heart, provides a new tool to help in this area. How will OAI-ORE affect repository architecture? Institutional repositories were effectively founded on the interoperablity provided by OAI-PMH. The first production release of ORE appeared late in 2008. As a result its potential to transform digital content collections has yet to be fully appreciated. The following papers shed some light on what may result. OAI-ORE provides opportunities to bind low-level objects into multiple collections that can be used by higher level software while avoiding the need to make copies. Binding objects in this manner would allow the construction of a layered repository where the core is the storage and binding and all other software and services sit on top of this layer. In this scenario, if a repository wanted to change its software, instead of migrating the objects from one software to another, we could simply swap the software. More work may open the possibility of two repository softwares simultaneously managing the same set of objects. Demo showing how data was moved between two repository softwares with quite distinct data models, from an EPrints repository to a Fedora repository and then back again, using the OAI-ORE. Video includes expert panel Q&A. The paper reveals how ORE might be applied at a whole-repository level.